Designers have once again raised the standard by which all others will be measured. 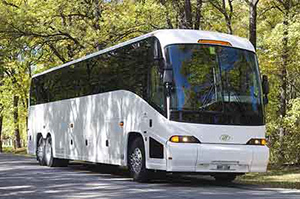 This is the latest in North American charter and touring coaches, with seating for up to 54 passengers. The exclusive patented spiral stairway serves a dual purpose. 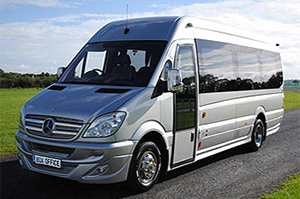 It eases passenger entry and departure. Large enclosed parcel racks increase passengers comfort and safety, as all carry-on items can be stored and secured overhead... out of the way, yet within easy reach. Compact, easy-to-use environmental controls allow passengers fingertip-access to desired lighting & air circulation. Other amenities include: Foot Rests, VHS Video Systems, AM/FM Stereo & PA Systems, Window Shades, Card Tables, Comfortable Reclining Seat Backs, Air Conditioning and Clean Sanitary Restrooms. Amenities include: • Air Conditioning • Comfortable Extra-Wide Seats • Foot Rests • AM/FM Stereo & PA Systems • VHS Video Systems • Window Shades • Card & Game Tables • Restrooms. Ideal for the following: small to medium size groups, clubs, group of friends or family reunions. We have planned many tours for individual groups from 6-100 people, family reunion, individual travelers, travel agencies and international tour operator throughout Alaska and Northern Canada. Our experienced Alaska tour planners may design a exciting tour for your customers to match their interests and requirements.